I love when mom goes out of town because that's when I take over the kitchen and cook my favorite dishes. You don't have to wait for me to leave to cook your meat. I know, but it's just easier. Mom's a vegetarian so she has special pots, utensils and tons of bleach for me and my meat dishes. And then the smell drives her batty. Consequently, mom has never tasted some of my specialties. I was shocked to find out that she apparently has a curried rice dish that I've never even heard of. 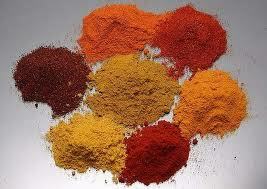 It's especially surprising since my daughter doesn't like Indian food, cumin or most of the spices that make up curry. 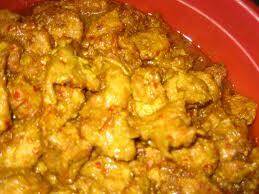 Now, the problem with many of the curry dishes is that they are fattening. Indians, Jamaicans and other natives of curry define it to mean a "stew" or "soup". 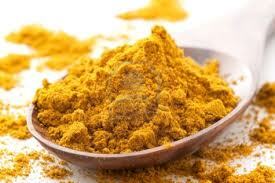 Here in the U.S., curry simply refers to the seasoning. And curry seasoning can be used like any other seasoning. I won't be adding coconut milk or any of the naughty stuff you'd find in the foods of India or Jamaica. You will still get the yummy curry taste without all of the fat that goes along with it. Before we even get to Ange's curried treats, I'm going to teach you how to make your own curry powder. 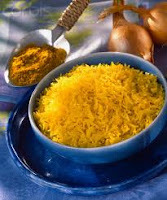 It's not essential to the recipes, but if you want the full yummy flavor then it's always best to make your own fresh curry blend. I'll be honest, I've never tried any of these recipes with store bought curry powder. But if you do get your standard McCormick's curry powder, don't use an old one that's been sitting around for months. Buy a new one and I'd recommend using double the amount of curry that the recipe calls for. Ange likes her food with a lot of curry. I like mine with a mild hint of curry. These recipes shoot right down the middle. So as always, season to your particular taste. Combine all ingredients in a bowl. Separate into equal parts and roll into a ball. Flatten the balls into patties then place them on a platter and cover. 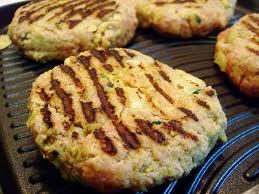 Put patties in refrigerator for a minimum of 2 hours or overnight. Remove patties from refrigerator and if needed, flatten them even further. Once patties are placed in the pan if you mash on them, you will only release what little juice they have. Wipe or spray a large frying pan with oil and place it on medium high heat until pan is hot. Place patties in pan, make sure there is enough oil for patties to slide easily in pan. Reduce heat to medium and cook patties 5 minutes on the first side. Turn patties using a spatula, cover pan and cook patties 3 minutes on the second side. Remove patties from pan and let them rest 6 minutes before cutting, piercing or serving in order for them to continue cooking internally. 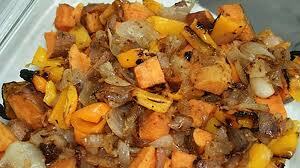 Serve with Sweet Potatoes Home Fries and a mixed green salad. Place all ingredients in a small pot and mix thoroughly. Bring to a boil then mix again. Reduce heat to its lowest setting and cover. This dish will go great with the Cashew Crusted Tilapia and New Age Greens. Place all ingredients in a glass container with a lid then shake vigorously until everything is combined. Store in a cool dry area up to 6 months. Season chicken with salt, thyme, rosemary and curry powder. Marinate for 2 hours in the refrigerator or overnight. In a heavy skillet add oil and brown the chicken pieces lightly for approximately 10 minutes. Check constantly to make sure chicken is not sticking. Add onions and garlic and sauté another 5 minutes, still making sure it's not sticking. Add water, bay leaf and pepper bring pan up to a boil then lower heat to lowest setting and cover. Simmer covered for 20 minutes without lifting the lid. Remove bay leaf before serving. Fish & Mercury - How much is too much? There's been lots of concern about the mercury in fish. For me, I'm thinking I'm making a healthier choice, but then started wondering if I was poisoning myself. Having worked with farmers, my dear child, I know that you are much better off eating fish than chicken. If you knew what they did to chickens you'd think twice before eating it. Even with the mercury, fish is a safer choice than chicken and beef which are pumped with antibiotics and live in inhumane environments. You know I could eat salmon all day everyday, so I'm not concerned about the mercury, but for those who are Mom has prepared a lovely article which will demystify how much is too much, which fish is safest and in what amounts. And as always, I wrap things up with two great recipes that are fun and yummy. Research shows that most people's fish consumption does not cause a health concern. However, high levels of mercury in the bloodstream of unborn babies and young children may harm the developing nervous system. With this in mind, FDA and EPA designed an advisory that if followed should keep an individual's mercury consumption below levels that have been shown to cause harm. By following these 3 recommendations for selecting and eating fish or shellfish, women and young children will receive the benefits of eating fish and shellfish and be confident that they have reduced their exposure to the harmful effects of mercury. Do not eat Shark, Swordfish, King Mackerel, or Tilefish because they contain high levels of mercury. Eat up to 12 ounces (2 average meals) a week of a variety of fish and shellfish that are lower in mercury. Five of the most commonly eaten fish that are low in mercury are SHRIMP, CANNED LIGHT TUNA, SALMON, POLLOCK, and CATFISH. Check local advisories about the safety of fish caught by family and friends in your local lakes, rivers, and coastal areas. If no advice is available, eat up to 6 ounces (one average meal) per week of fish you catch from local waters, but don't consume any other fish during that week. Follow these same recommendations when feeding fish and shellfish to young children, but serve smaller portions. The bottom line is that we can safely eat 2 six ounce servings of seafood per week. So when we pig out at that Friday night seafood buffet, that’s it for a week or two depending on how much we ate. All right its time for the recipes now. Rinse tilapia and pat dry with a paper towel. Cut lemon in half and squeeze juice over each fillet both sides and set aside. Place cashews, panko and cayenne pepper in a food processor and run until cashews are finely chopped then pour on to a plate. Mix together the flour, sea salt, garlic powder and onion powder then pour mixture on another plate. Whisk together egg whites in a bowl large enough to fit 1 fillet. 1. Pat dry fillets and dredge in flour (fish should be covered in a fine dust layer of flour). 2. Dip fillets in egg white, shake off excess egg. 3. Press fillets firmly into cashew mixture until both sides are coated. Place fillets on an oiled sheet pan then bake in a preheated 400 degree oven 15 - 20 minutes. Note: Rule of thumb for cooking fish: Cook for 10 minutes per inch of thickness. So if the fillet is 1 ½” thick, cook it for 15 minutes. This dish will go well with the Strawberry Spinach Salad and Oven Roasted Vegetables. 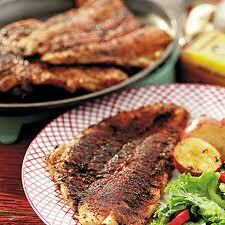 We always have blackened catfish, this time we are going to try flounder; which is normally a very bland fish. I think it’s time to perk it up! Wash fish and pat dry with a paper towel. Combine salt, onion powder and garlic powder, then sprinkle mixture on both sides of fish and set aside (this process can be done the day before). If fish is too moist, gently pat dry with a paper towel. Combine the blackening spice and spread it out on a plate. Press fish in the seasoning, brushing off any excess. Place 2 pieces of fish in the pan. Make sure they are not touching each other. Cook for 3 – 5 minutes on the first side (depends on how thick the fish is). Reduce heat to medium or medium/high, flip fish over with a spatula and/or tongs and cook an addition 2 – 3 minutes on the second side. Transfer fish to a platter, remove any excess crumbs from pan, and add more oil. Let pan and oil get hot again before adding another batch of fish. Note: Only turn fish once, it should be 50% done before turning it over. You can tell because the color will change to opaque. Keep an eye on the heat level. If it’s smoking and cooking too fast, adjust the heat gradually. We always have blackened catfish, but this time, we chose salmon because you can really blacken any fish you choose. It's all in the seasoning. In a large bowl, whisk together the oil, lemon juice, garlic powder, onion powder, oregano and chili peppers. Scrub yams and peel off any discolored or bad spots on the skin and cut into wedges. Remove tops from fennel, cut bulb in half and remove the core. 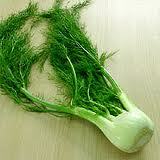 Cut fennel in fourths. Peel onions and cut into eight wedges. Toss yams, fennel, onions and garlic into the bowl of dressing and make sure that each piece is thoroughly covered. Place one layer of the vegetables on the sheet pans, do not stack or crowd the vegetables on the pans. 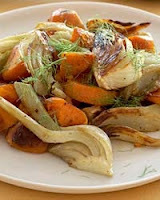 Bake vegetables in a preheated oven 35 – 45 minutes or until potatoes are tender and golden brown. Wash potatoes and scrub with a vegetable brush. Using a vegetable peeler, remove some of the skin from the potatoes, slice or dice potatoes. Heat olive oil in a large skillet; add potatoes, onions peppers and garlic, mix until coated with oil. Sprinkle in dry seasonings and mix thoroughly. 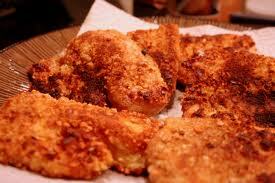 Cook uncovered until potatoes are golden brown and tender, turning 3 to 4 times in a thirty minute period. 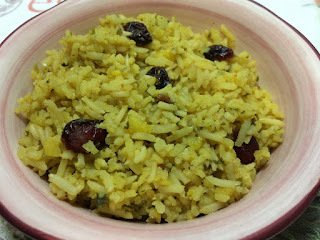 Our Oct 18, 2010 blog “Forget the Candied and go for the Yams” was our most popular one thus far. Therefore I feel that the folks are really interested in yams/sweet potatoes. So I went out and hunted for every variety of yams and sweet potatoes I could find. It was not an easy task, but I came up with these babies. Before I go to the recipes, here is a brief history on yams and sweet potatoes. There are 600 different varieties of yams and 95% of them are grown in Africa. The flesh colors vary from white to purple and the thick skin comes in white, pink or brownish-black. Their shape is long and tubular. Their taste is earthy and hearty, with most varieties having little to no sweetness. This does not sound like the description of the "yams" we had for Thanksgiving dinner. That is because there is great confusion between yams and sweet potatoes in the United States. 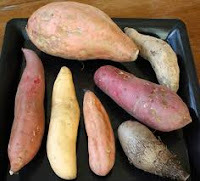 Most of the vegetables that are labeled "yams" in the US markets are really orange-colored sweet potatoes. The sweet potato skin color can range from white to yellow, red, purple or brown. The flesh also ranges in color from white to yellow, orange, or orange-red. Unless you shopping in an international market, you are probably eating sweet potatoes! For those of you who have read about the incredible health benefits of the yam, you will not receive the same benefits from the sweet potato, so do your research. Yams are a good source of dietary fiber; vitamin C, manganese, potassium and vitamin B6. Alright, enough about yams/sweet potatoes here are a few good recipes which can be used for breakfast, lunch or dinner.